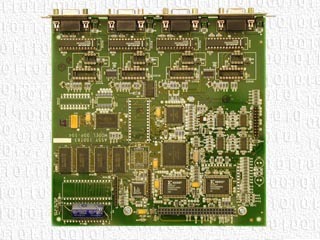 The DDP-104 is a four port data demultiplexer expansion card for use with ICP Model DCR-972/974 DigiCeiver®. The DCR-972/974 is a multi-function satellite broadcast receiver. The basic DCR-972/974 provides one data output and one optional data port. It also has two expansion slots for additional data or audio capability. Up to two of DDP-104 expansion cards can be added for a total of ten data outputs from a single DCR-972/974. The DDP-104 allows a user to rapidly and cost effectively change and/or grow a network. The DDP-104 card is plug compatible with the two expansion slots in the DCR-972/974 and is field insertable. Once installed, final operating configuration parameters are downloaded either over-the-network or through the receiver remote control port by the Network Control System (NCS). Data outputs may be authorized or de-authorized at any time via in-band commands from the NCS. Each of the four DDP-104 ports can be configured either Time Division Multiplexed (TDM) or packet multiplexed data. In the TDM mode, a DDP-104 port will extract a transparent synchronous data channel from the TDM aggregate stream. Data rates for each port are selected by combining aggregate time slots in 64 kbps increments, limited by the aggregate maximum. The DDP-104 is compatible with all ICP TDM multiplexers. A DDP-104 port can also be configured in packet mode to provide either synchronous or asynchronous data outputs. When operating in packet mode, the DDP-104 includes product ID's. Product ID's allow individual receiver ports to be programmed from the NCS for selected services while restricting all others. The DDP-104 is compatible with all ICP packet multiplexers. Configuration of the DDP-104 is controlled and monitored by the ICP Network Control System (NCS). The NCS provides complete over-the-network configuration and control including demultiplexer configuration, data port parameters, product ID's, and/or complete replacement of the main processor code. Configuration and software download can also be accomplished via the DCR-972/974 remote control connector. Multiples of 64 kbps in TDM mode. Standard rates from 300 to 115.2 k baud in packet multiplexed mode. Product ID codes downloadable to individual ports to allow customization of services provided by each port. Provided by the ICP NCS system. RS-232 or RS-422 selected by installing the appropriate driver module. Selection of demultiplexer mode, data rate and protocol for each port and expansion in the system. NCS commands are sent to the receiver via the NCS control channel included in the aggregate data. The receiver control processor interprets these commands and provides the provides the proper configuration for the demultiplexer. Main processor code can be upgraded to all field installations from the head-end. Plug-in printed circuit board, approximately 7.2" x 7.2"
Data outputs provided by four female 9 pin "D" type connectors.